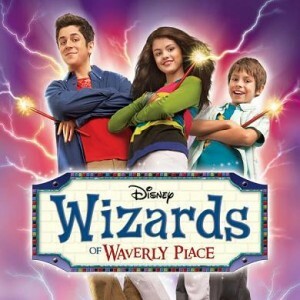 The Disney Channel and Disney XD create new shows all the time and the way many of them start is with a pilot episode. When production companies have an ides for a new show, they need to film a pilot for the show so that they can show the show to potential buyers and networks like the Disney Chanel, Disney XD, Nickelodeon and all the other major networks like CBS and ABC. Most networks receive hundreds of pitches for new shows every year and those networks go through the pitches and ideas and pick some to film pilot episodes. With so many networks around these days because of cable and satellite, there are always pilots being shot, not just during pilot season which has traditionally been the summer, but all year long. The production company usually gets a casting director to cast the pilot and often times the actors cast stay on for the series if the show gets picked up. Pilots are created to showcase and sell not just the writing for the new show, but also the cast and most of the actors cast will remain on the new show if it gets sold. Pilots are a big deal in Hollywood and many actors come from all over to audition for them. Many child stars became famous because they auditioned for the right pilot, got the job and the pilot was picked up by the network to become a series. The more pilots you audition for the greater your chances of getting onto a Disney Channel TV show. If you want to have your own Disney show, you need to start auditioning for pilots and the way to do that is by having an agent and usually being where filming is like Los Angeles. To get into a new Disney show it is very important to have an agent since new shows normally are not cast through open calls. Production companies already have a script and have the type of characters in mind that they want. They communicate their needs to agents and the agents then send the appropriate actors to them for auditions. Without having a good agent or living in Los Angeles it would be very difficult to get cast onto a new Disney Channel show because you would not know where to go to audition or even have an appointment to do so. 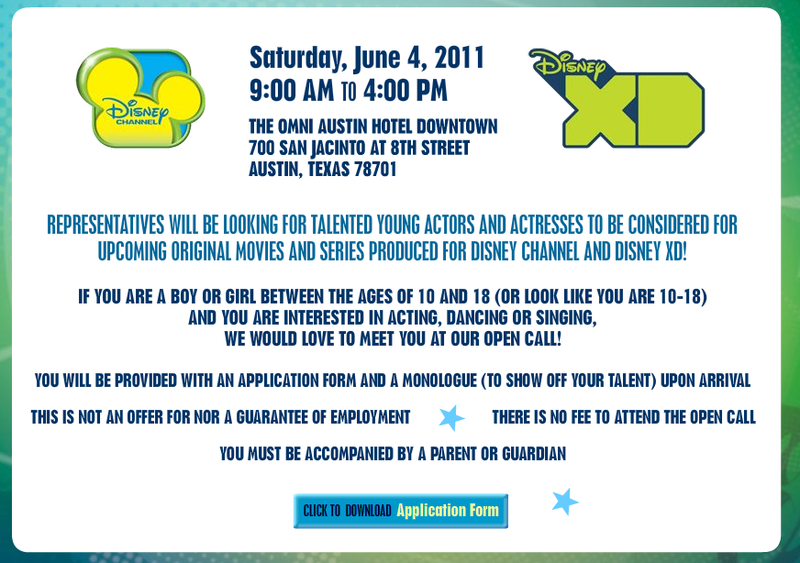 However, Disney does have open casting calls a few times a year in various cities. These casting calls are usually not for any series or production but more to try to spot new young talent. When the Disney Channel announces and open call, they usually get 1000’s of hopeful young actors coming from across the country to meet with the casting directors. If at that time the casting directors like you and believe you have great potential, they may call you back to audition when a new show is ordered. 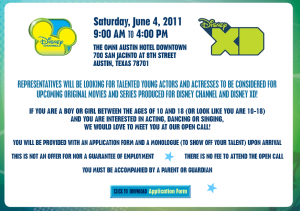 The last Disney Channel open call was in June of last year in Austin Texas. Disney announced the open call a few weeks prior to its scheduled date and thousands of kids showed up with their families. The event was held to find potential child actors to be cast in Disney original movies as well as new shows going into production by Disney XD and the Disney Channel. Specific show or movies were never announced but the age range they were searching for was 10 to 18 years old. We can expect another open call event or maybe 2 this year in 2012. So keep your eyes and ears open for the next event and maybe you too can become the next child acting sensation. You can check out last years notice to the left, hopefully another one like that for 2012 will go out very soon and maybe you too will have a chance to star in a new Disney channel show! Sorry made a mistake with spelling from! And I love disney and I’m a very sweet girl and I hope for the best thanks disney. Please I’m a 13 year-old girl who has always wanted to act on disney I can sing and act. I am from South Africa can you please make my dreams come true thanks. Hi, my name is Tyler and I’m a 13 year old boy.I live in Webb City Missouri. I love to act and Disney Channel and Disney CD rock. I’m jewel and I’m 12 almost 13. I have blonde hair and hazel eyes and I usually dye my hair. I’m cutting my bangs and will audition for a lot of shows just give me the time and place to meet you, I live in banks Oregon and I absolutely LOVE acting, its basically my life. I have always dreamed of being a famous singer/actor! It would be a dream come true to be on disney! I also get the chance to sing at my local opry! I want to be an actor. This has been my dream. I’m about 5′ and I’m 12 years old. I’m good at acting. please select me thank you. I have short/medium brown hair and golden/brown eyes and I love acting. I really want to be on Disney channel. I have been to so many auditions and there were all fake but I have faith in me and some day I will be on TV. I am 13 years old, I have black curly hair and I live in Las Vegas Nevada. I am so happy to be on this website. hi, my last name is Inda hard to pronounce but I love singing,acting, and modeling. My mom and dad have worked so hard, we have a normal life. I live in Houston Texas. I’m an American citizen, I’m Latina, I have brown eyes , black hair , skinny. I’m in 6th grade, 11 years old. I need this opportunity. If I was to get any acting job, it would be so amazing because I love acting. Hi, I’m from Canada and I love acting! I am always involved in speaking at school and I can sing a bit. One of my dreams is to make it in acting, I love it so much! I will take any part, even if it’s a small role. As long as I’m acting, I’m cool with it! I am vaani gupta… an indian.. I am good at dancing, singing, english songs and acting. I always wanted to become a Disney channel star. Its my lifelong dream to be a big actress on disney channel. I live in London and please send a reply to me. I’ve always wanted to be an actress. If I don’t know you I’ll be pretty shy. But don’t let that make you think I’m a very sweet girl cause I can be pretty sour. But if I got to be on TV I would Greek it, would be a dream come true, by the way I’m 10 years old. I love acting and would love to be an extra. I’ve been acting since I was 4 or 5. I have been in different plays and I always enter talent shows at school. I won 5 years in a row but I live in NZ and if I get the opportunity, I would give it everything I got, so please pick me. My name is Kyah Meade.I live in London and I am 12 years old. I’ve always wanted to be an actress or a singer but I want to be like Selena Gomez because she was an actress first then went on being a actress. I am a bubbly, warm hearted person. You can rely on me because I’m very dedicated to my work. I can have fun but also be into my work. Please get back to me at my hotmail if you would like to offer me a acting audition or any opportunities. My name’s Aya and I’m from Montereal. I’m 11 years old and I’m a brunette. I have a talent of singing, playing guitar and acting too. I mostly spend my days playing guitar. I acted in some videos, me and my sisters, cousins and friends have made. My sister comes up with some of the ideas but I edited the videos with music, sound effects and background colors. I act in all of them because it’s a hobby of mine. I will always do my best in every chance i get to be an actor. Hi Disney, my name is Rikiyah. I am 16 and I live in Oklahoma. My life long dream is to be an actress. I am 5’5, have hazel eyes and my hair is fairly long. If you gave me the chance, I guarantee you won’t be let down! hello I’m Jordan Mcloughlin and I’m 12, nearly 13. Birthday in 11th November and I want to be on Disney channel so bad. I have been watching it when I was a little kid. I have short black hair, 5 foot, average weight, brown eyes, and I live in the UK. I’m a boy and I badly want to get on Disney channel. Why I want to become a actress: I have always wanted to become an actress. I have no experience but I am a fast learner and once I set my mind to something, I do it no matter what . I love acting a singing and I would put all my effort into this. My name is Anna Leishman and I am 10 years old. Nothing can stop me dreaming about being on Disney channel and I know that I won’t give up trying to get on any Disney channel show. My favorite show is Shake It Up and I would absolutely love to meet Bella Thorne and Zendaya. My biggest dream is to be on Disney channel. Ok, my sixth comment, wrote this because I really want this. Hey, my name is Muadi. I wanna be an actress because since I was a little girl, my mom was auditioning me for many plays and when I was 4 years old I was in a play. It was a great feeling being on stage and I want to have that feeling as much as I can!!! I have acting, dancing, singing, piano, and drums skills. Being an actress would be the greatest thing that could happen to me!!! Nickelodeon and Disney channel. I promise to always be hard working this is my fourth comment, find a role for me. Once again my third comment, please find me a role. I love the two channels(nickelodeon and disney channel). I also want my dreams to come true and to meet selena my idol, and justin bieber, my favorite singer. Help me, I want this and I can play any role,can dance act, sing. I’m in South Africa. I will not give up on my dreams. Do this for this 12 year old. I am 12 years old and auditioned for my first play at the age of 4 years old. I can dance, sing, act and I am so funny. I love goofing around, love Disney and nickelodeon. I watched it wen I was 5 years old, more than anything. Give me a role even any country. I’m in South Africa. I was born on the 8/8/2001. I have longish brown hair,green eyes and I live in Leeds. It has been my dream to be a actress all my life. Hi I’m Sylvia. I live in Kenya and I have no problem with travelling to achieve my dream of acting with Disney Channel. I’m 14 yrs old and many people acknowledge my singing, acting and rapping. I have brown eyes, brown and black hair and I am 4ft-5. I would really appreciate to be given a chance to have my big break. I am 10. I am Cuban, Romanian and Canadian. I am willing to travel(my mom said). I have been singing before I could talk or walk. I have been acting for 4 years now and modeling for 2. I love what I do and would love to be on Family channel. Any channel really. I want to get out because I have talent. You don’t get first place every time you go for Kiwanis or competitions if you don’t have talent. I am not trying to sound rude but music goes around my family. To become famous would become the world to me. Hi, my name is Hannah and it has always been my dream to become a Disney Channel star. I am 5’4” and I am 12 years old. I love to sing, dance, act, play sports, and hang out with friends and family. Many people say, “Follow your dream and it will come true.” Well, this is my dream. My name is Angelica. I am 9 years old and I was born in Canada. I love acting, my friends and love putting on a show . I know when it is time to be silly and to be serious. We know that acting takes responsibility and IMPORTANT achievements. My name on my website is Angelica Apolinario. Hi I’m Friday Gokana. I love to act, sing and dance. I love to go to church with my family. I performed in my school a lot. I am not shy. I have been watching disney channel shows for over 5 years and I pray to God that I will be in the next series star. I am 5’3″, African American who loves to sing, dance, and most of all act. please contact me when you get this message. My name is Aran and I am a 11 yo Chinese boy who loves singing and acting. I like watching Disney Channel. I love God and my family. I easily cry and I have mixed beauty. I am half Lebanese and half Philippine. I born in Kuwait. I love acting. I can make you cry and laugh. Once I made the audience not stop laughing. I can somehow sing and dance and am friendly and easy to communicate with. I can dress up older than my age too. Hi, my name is Aryan Jordan and I would like to tell you a little about myself and share with you why I should be considered for Disney TV shows. I’m a 15-year-old female, soon to be 16 on August 17th. I’m tall and slender, around 5’8, and FULL of personality! I have a bit of a high-pitched voice for my age, which people find unique, but I don’t allow that to stop me from being myself. I love spending time with my family and friends laughing and making others laugh. I’m preparing to enter my junior year in High School and am active on the cheerleading squad, basketball and track teams. Some try to label me as shy, but once they get to know me they realize I’m far from shy. From birth I’ve participated in events such as baby beauty pageants to plays at school, church, summer camp, etc. I have always dreamed of being in the spotlight for singing, modeling or dancing. Although, I enjoy dancing, I don’t feel it’s my strongest asset; yet my passion, sincerity and energy would cause one to never know. I give everything my all…100% and oh, I love the colors blue and green. I’ve watched the Disney channel and Disney shows for as long as I can remember and would LOVE the opportunity to audition to be on one. I think I could very well die of excitement, if given the chance (lol, not really). I know that I would be an asset to any show, and hope that you’ll give me a try. I thank you for your time in reading this and I really hope I’m what you’re looking for!